The first step in battling the severity of postpartum depression is knowing how to spot the symptoms. Postpartum depression is a part of pregnancy for which most parents are unprepared. Our culture tends to downplay the difficulty of the early weeks, telling us we should be thrilled with parenthood and grateful for the experience. However, the reality is that the postpartum period is a mix of joyous and difficult moments. The unpredictability of each day, the lack of control over your schedule, the sleep deprivation, the fact that the baby can’t tell you what they want and the sheer amount of work, all on top of a host of dramatic physical and hormonal changes, make for a challenging situation. Nobody expects to feel sad after the birth of their baby, but, in fact, many do: Approximately 15 percent to 20 percent develop a postpartum mood disorder (PPMD), best known as postpartum depression. A PPMD can affect anyone after birth, with any health history, in any circumstances. Although a PPMD most commonly begins during the first three months after birth, it can start any time within the first postpartum year. The vast majority with a PPMD are wonderful, loving parents who are unfortunately experiencing a medical illness that is no fault of their own. While you can’t prevent PPMDs, the good news is that they are treatable, and you may also be able to lessen their severity by knowing how to spot the symptoms. Getting help early on and not waiting for the condition to reach a crisis point usually means a more rapid recovery and a happier, less stressful time for everyone. The difference between normal post-birth emotions and postpartum depression is not always clear-cut. A majority (60 percent to 80 percent) experience the “baby blues” in the first or second week after birth: They feel occasionally weepy, irritable, and, perhaps, a little anxious, and these feeling come and go. What you need if you’re experiencing postpartum blues is usually a hug and a nap. By the end of the first or second week, the blues should be gone. Symptoms that extend or worsen after that time are more likely to be signs of postpartum depression. Most people with a postpartum illness know that something isn’t right—they just don’t feel like themselves—so trust your instincts. PPMDs affect everyone differently, but some of the more common symptoms include a persistent sad or “down” feeling, tearfulness, a poor appetite, sleeplessness (even when the baby is asleep) and feeling guilty, overwhelmed and hopeless. Those with postpartum depression often find it difficult to get through the day because they feel like everything is an effort. Not much—not even the baby—brings them joy. Some feel postpartum illness in a different way: They feel anxious, “sped up” and worried about everything. If you have been experiencing several of these symptoms for two weeks or longer, and nothing you or your co-parent are doing is providing relief, it’s time to call for help. Usually the best place to start is with your doctor, midwife or childbirth educator. They should be very familiar with the signs of a PPMD and know where to refer you. A therapist who specializes in women’s mental health would also be an excellent option. Of course, if you are having any thoughts about harming yourself or your baby, you should immediately call 911 or go to the emergency room. There is no way to accurately predict who will develop postpartum depression, but there are some factors that seem to make it more likely. These include a personal or family history of depression or another mental health disorder; an unhappy or stressful childhood; stressful life circumstances (such as financial difficulties) and a lack of support from your family and friends. 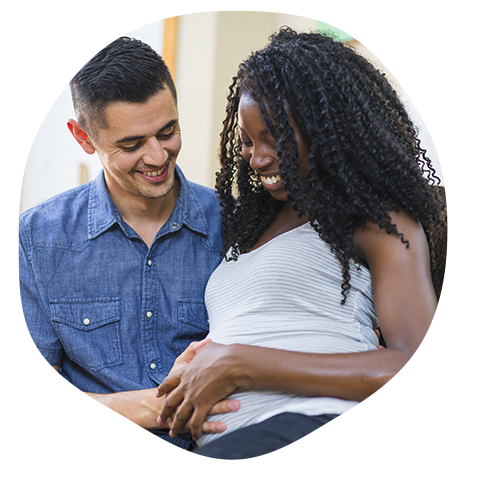 If you think you might be at risk for a PPMD, discuss your concerns with your health care provider before you give birth so that you can both be on the lookout for symptoms. A disappointing or difficult birth might contribute to PPMD as well. Those who had to face extra challenges in labor tend to have a more difficult time processing their birth experience because they may harbor feelings of anger or disappointment. If you have negative feelings about the birth or your baby, find a supportive, nonjudgmental person to talk to. If you find that these feelings are not subsiding or are getting in the way of enjoying your baby, seek professional help. PPMD treatment varies from person to person and according to your symptoms. The most common treatment options include some form of talk therapy or medication, but some new methods, such as light therapy, are becoming more widely available. Discuss the pros and cons of each approach with your healthcare provider or therapist. With treatment, an average PPMD episode lasts six to eight weeks. Without treatment, it can take up to a year or longer to resolve. During the recovery phase, you need to be sure to take extra good care of yourself. The following measures may be basic, but they can help you if you are dealing with a PPMD help yourself. Seek out friends, family or hired help, such as a postpartum doula, to ease your workload so that you can get much needed rest and save your limited energy for when you need it most. Maintain a healthy diet and don’t use coffee, tea or other sources of caffeine as a pick-me up: They will only worsen anxiety and depression. Try to fit exercise into your day, even if it’s just a 20-minute walk around your neighborhood with your baby in the stroller. Studies have found that the endorphin release from exercise actually promotes a sense of well-being and can lessen feelings of depression or anxiety. Occasionally take breaks from baby care. Talk with other parents, sympathetic friends and loved ones about your feelings and what you’re experiencing. There are also web sites where you can chat with other new parents with PPMDs, such as Postpartum Support International or Postpartum Support Group. Above all, be gentle with yourself. You didn’t choose to have this illness. Give yourself credit for doing the hard work of labor and stay hopeful. The postpartum period doesn’t last forever. It takes time and patience, but with help you will soon see an improvement and ultimately a full recovery.